Bullying—for years it has been the reason for fake illnesses, the mysterious need for extra lunch money, and more recently the tragic motive behind some suicides. Bullying is a serious issue. No wonder a whole month is dedicated to shedding some light on the issue. But while most energy and time is spent lecturing students about bullying, recent headlines prove teachers could actually benefit from a good lecture or two themselves. From the teacher who was caught on tape taunting a special-needs student, to the teacher who was filmed unloading on a student and saying “I will kick your a** from here to kingdom come,” to the coach who told one of his basketball players he was destined to become a future welfare recipient, it’s evident that teachers can be bullies too. In fact, according to research, 2% of all children are harassed by their teachers at least once during their academic careers. 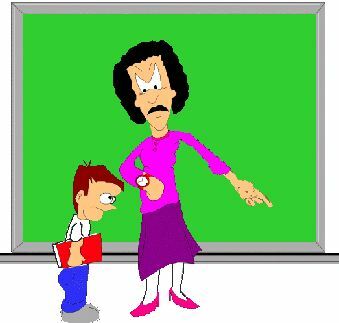 It’s not certain why some teachers choose to abuse their authoritative power and belittle/humiliate their students in class, but it happens more frequently than parents would like to believe. And since teachers are older, stronger, and seen as “scarier,” the effects a bully teacher has on your child may be much worse than a bully his or her age. Don’t let your child be a victim. Follow these tips below to learn how to handle these sorts of situations. 1. Talk to Your Kid About School. Whether it’s immediately after picking up your child from football practice, at the dinner table, or when casually watching TV together, always try to ask about your child’s day at school. Some children are more open about the good and bad days and will tell you if they’ve been harassed by a teacher; others will try to keep it all in. If your child happens to do the latter, try to pick up on cues that your child may be distressed. Encourage them to openly talk with you but don’t try to push too hard. If you finally catch wind that your child’s teacher is the problem, assure your child you will resolve the issue. * Note: While some children may be more than happy for you to take charge and get involved, others may beg you not to. Assure your child that you will handle it in a tasteful manner, but verbal abuse is never ok and you cannot let their teacher’s behavior carry on. 2. Set up a Personal Meeting With the Teacher. Your next step would be to set up a private meeting strictly between you and the teacher. While you may be heated, it may be wise not to start the conversation too aggressively (don’t confront the teacher right off the bat). Instead, try a different approach. Comment on how you’ve noticed your child seems to feel really anxious and stressed about coming to his or her class lately and see how the teacher reacts. Do they seem uneasy? Listen to the teacher’s explanation of why he or she thinks your child now has this odd behavior. If you don’t like the answer, then you can take your complaint to a higher figure such as a principal. *Whatever the case, try to keep your composure (no threatening), and make sure you keep written documentation of what was said during every encounter you’ve had with school staff and administrators. 3. Make a Complaint with the Superintendent.Lastly, if the principal does not resolve the issue, then go straight to the head honcho—the district’s superintendent. He or she should definitely be able to accommodate you and take the matter seriously. If the issue still remains, then consider transferring your child to a different school and file an official complaint with the state licensing board—there is no reason the teacher should be able to continue to educate (and possibly bully) other children. This is a guest post from Jacelyn Thomas. Jacelyn writes about identity theft prevention for IdentityTheft.net. She can be reached at: jacelyn.thomas@ gmail.com. Thank you for this special contribution by Jacelyn Thomas. Join me on Facebook and follow me on Twitter for more information and educational articles on parenting today’s teenagers. ← Good Kids, Bad Choices: Good Self-Esteem Can Lead to Better Choices! 5 Ways to BOOST Self-Confidence! Parent’s Universal Resources: Join Us!